It’s no secret that Facebook contests can yield astounding results. Whether you’re looking to gain new followers or generate leads (or both! 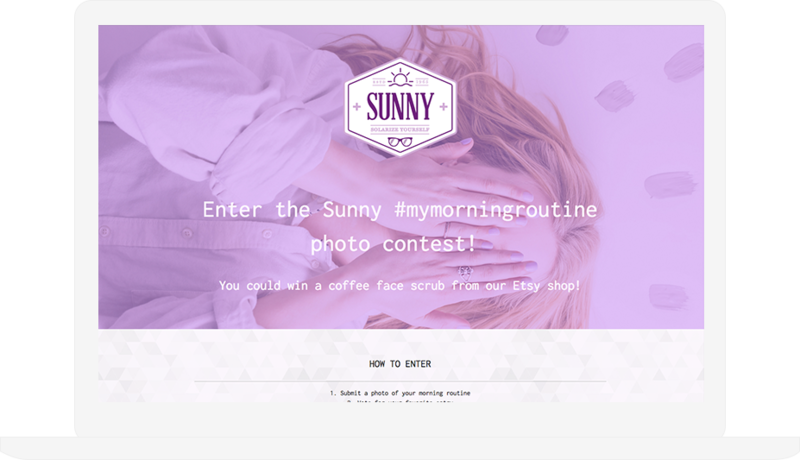 ), plenty of businesses have proven that social contests are an excellent way to do so. It’s why we hear about incredible examples, like Qwertee using contests to get 100,000 likes or Cruise Line International Association collecting 106,000 entries in a month-long contest. These contests obviously had excellent strategies to get these results. Just as important, they were able to avoid mistakes that are commonly made with Facebook contests. These mistakes can have a significant impact on your campaign, potentially sinking an otherwise brilliant contest. Since we want your contests to get the results you’re dreaming of, let’s take a close look at eight of the most common mistakes brands make with their Facebook contests. No one is going to enter your contest if it isn’t worth the time it takes to do so. I was scrolling through my newsfeed and came across a contest from a big marketing firm that required me to fill out a lead form, Like the business on Facebook, and create a post with a hashtag. The prize for all this? A $5 Starbucks gift card. Nope. Your prize only needs to be valuable to your customers. This doesn’t mean you need to break the bank. In fact, if the prize had been more relevant — like a dessert from a local restaurant, I might have entered despite all the hoops I had to jump through. Bottom line: The prize should be proportionate in value to what your business sells, and it has to be something that your audience wants enough to spend a few minutes it takes to enter the contest. If you’re on a tight marketing budget, look at it this way. A prize worth $100 that generates 2,000 leads will give you a higher ROI than any PPC campaign you could ever dream of running. When businesses are trying to overcompensate to avoid mistake number one, they make mistake number two. They seek to make their prize as appealing to as many people as possible, to the point where it often backfires. If you saw a business advertising a $1,000 cash prize or an iPad, and to enter you just had to enter in your email address, would you do it? Most people would. They’d do so even if they lived on a diet of bacon and eggs, and the company hosting the contest was a vegan restaurant. 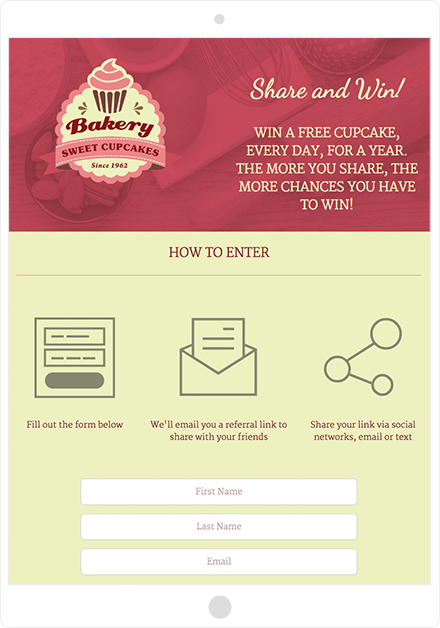 Your prize should always be relevant to your exact target audience, like this example created with ShortStack. In cases like this, the prizes that are high value and generic will attract a ton of engagement and plenty of leads. Unfortunately, a large number of those leads will be useless. The people who entered aren’t interested in your business; they only wanted the prize. Instead of offering a generic, appealing-to-everyone prize, offer a prize that is still valuable but mostly interesting to your exact audience. A yoga studio could offer a month of free classes, a yoga mat or a water bottle. A car repair shop could offer a free oil change or a coupon for free car wash. When in doubt, you can always make the prize a gift certificate to your own business. I’ve had clients who say “I want to run a Facebook contest,” but then have no specific goals on what they want the contest to actually accomplish; they just read that running contests can be an effective marketing strategy and that’s as far as they go. You need to have defined goals for your contest. These could be anything from increasing brand awareness and gathering more followers to collecting leads and making sales. More important, however, you need to choose specific, measurable goals and decide how you want to measure them. Want to get brand engagement? 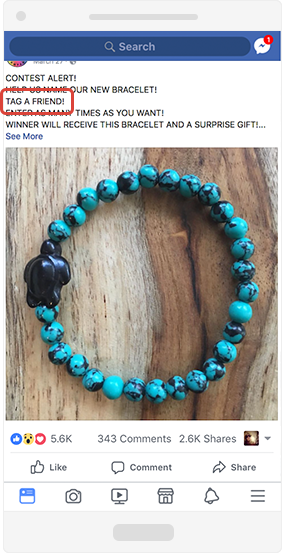 A small business could try to get 4,000 likes, comments, and shares on a two-week long post. Want more followers? Put the emphasis of your contest on liking your Page, and shoot for a certain number of likes. By defining your goals, you’ll be able to decide how valuable your contest is, and how much ROI you can expect. This will give you a more accurate view of how your contest is actually improving your business. This contest, which requires users to tag a friend, violates Facebook’s promotional guidelines. Double check the contest rules before you get started. Facebook’s contest rules are different from the rules of other social platforms, and they change often so make sure you’re up to speed. Copywriting can be easy to overlook; how hard can it be to offer up a prize, after all? In reality, however, copywriting can make or break your contest just as much as any other mistake on this list. The copy you use can help build up and sell the prize, evoke a sense of urgency to get users to “sign up now,” and create a hashtag and tagline combo that can help your contest go viral. Poor copywriting would include cheesy sales language, neglecting to explain the value of the prize, or making the contest rules or instructions too complicated to follow. The example above shows some great examples of strong copywriting that other businesses could copy. They have a catchy hashtag; use “you could win” verbiage to increase anticipation, and have very concise contest rules that should be clear to anyone who wants to enter. Contest software like ShortStack is the only way to actually generate leads during a Facebook contest, and yet so many brands still run timeline contests that don’t bring in true leads. Bottom line: when you do use software, it works in your favor. Likes, followers, and brand awareness are all excellent goals for your contests, but the ability to acquire new leads at a relatively low cost per acquisition is an opportunity no business should ever pass up. 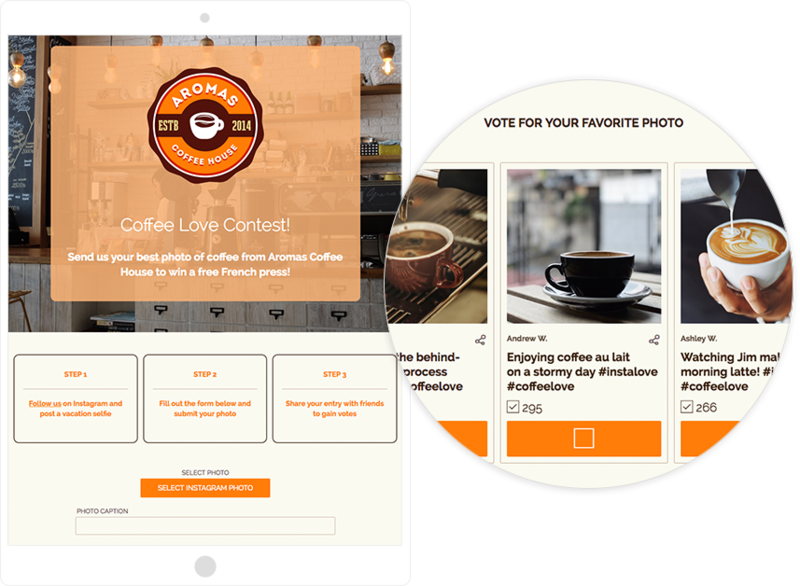 Contest software allows you to collect leads through a secure form that customers will trust, and that you can use to build email lists. ShortStack’s templates are designed to be high-converting, and can be embedded on Facebook and on your website. Mobile usage has long surpassed desktop usage, yet businesses are still forgetting to optimize for mobile users. 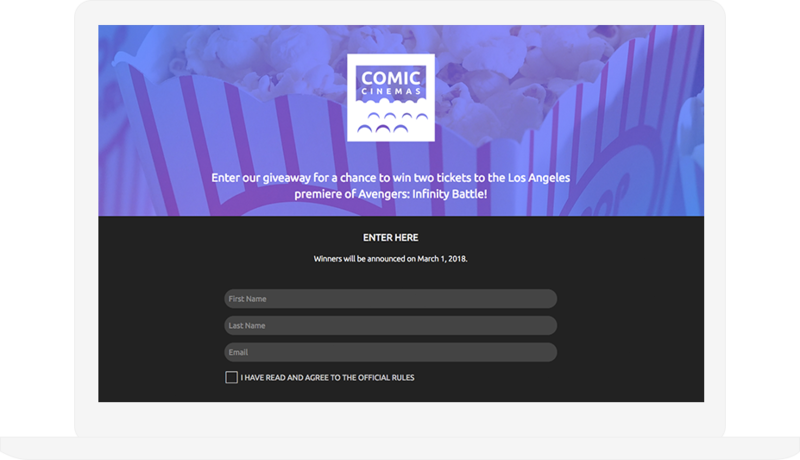 The lead forms that you’re using must be optimized for mobile devices, or you’ll miss out on a ton of contest entries. Unlike some of our competitors, ShortStack templates are automatically mobile-optimized so you’ll never miss a single lead. It’s easy to set your contest on autopilot and let it run, but that’s not a good idea. You should be actively tracking the progress of your contest as it’s actually happening. This means monitoring to see how many leads you’re getting and the level of engagement. Not only will you be able to see if you need to promote the contest more heavily in order to reach your goals, you’ll also be able to see how close you are to reaching those goals. 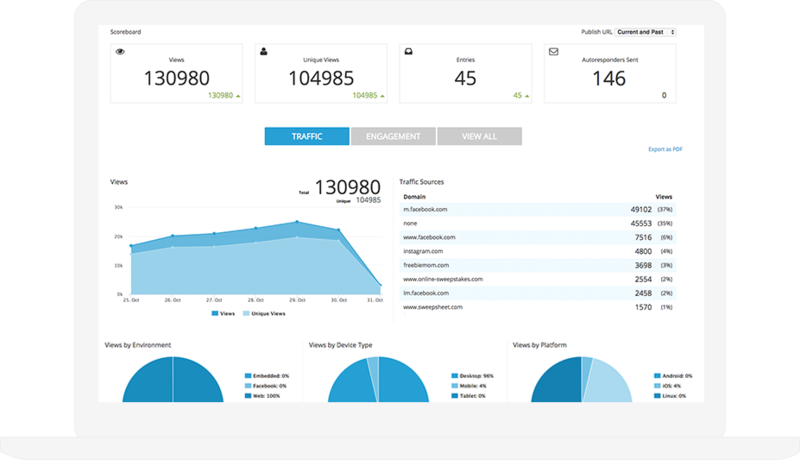 ShortStack has detailed analytics for social contests, telling you how many shares you’re getting, where the traffic is coming from, how much engagement you’re getting, and how many entries your contest is receiving. All of this is crucial to seeing the big picture of your contest, and you can do it in real-time. If you want to rock your Facebook contests and get tangible results from them, watch out for these common pitfalls. Each of these mistakes will be enough to hinder the quality of leads you get from your contests, making the contests less valuable. Ana Gotter is a regular contributor to the ShortStack blog. She also writes for sites including Social Media Examiner, Business 2 Community and Adspresso. Find her at anagotter.com. Read more articles by Ana Gotter.